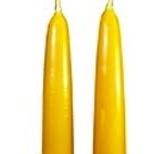 Very large diameter beeswax tapers come in five lengths. Our 24" x 1.25" dipped candles are quite extraordinary and will add elegance to any decor. Using only 100% pure beeswax these large tapers are hand dipped by Beeswax Candle Works In Cottage Grove, Oregon. These require a special size candle holder. The candles are sold by the pair.